Rotary's Contribution to Reduce Global Warming. Cheque presentation to North West Air Ambulance. Cheque presentation to Alzheimer's Society. Rotary Club of Sandbach Crosses - welcome! Please scroll/swipe down through this page to find out more about us, in addition to the pages linked in the menu, top-left. Rotatary Club of Sandbach Crosses president, David Whitworth presenting a cheque for £600.00 to Jeanette Booth, Dementia Support Worker with Alzheimer's Society. 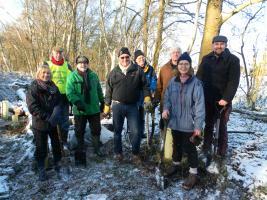 Ten Rotarians from Sandbach & Sandbach Crosses Club arrived at Brereton Heath Nature Reserve on 11th December 2017 to plant 55 young trees. 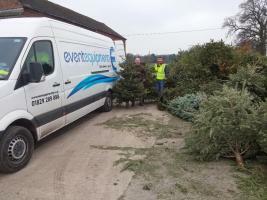 There were almost 400 trees collected this year which contributed to the record £27,000.00 plus which was raised for St Lukes Hospice. Well done and thank you to all that helped. 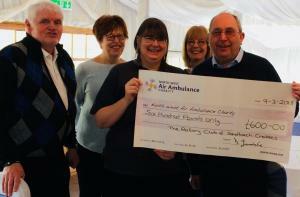 Rotary Club of Sandbach Crosses raised an amazing £2,941.00. 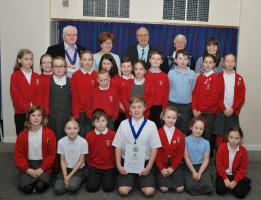 Elworth Hall School RotaKids sponsorded by Rotary Club of Sandbach & Sandbach Crosses. The third RotaKids Club in Sandbach was started in September 2017. Following the hugely successful Santa Collection this year, a cheque for £600.00 was presented to Deborah Millican of North West Air Ambulance at Malkins Bank Golf Club. We meet on Tuesday evening at 7.30 at the recently refurbished "Wheatsheaf ", Hightown, Sandbach - our original home with plenty of room for all the club members to attend meetings and guests, potential new members and speakers to be invited. Incoming President Jean Billingsley with President Elects Kath Neame and Allan Jones. It is a real pleasure to be elected President of the Rotary Club of Sandbach Crosses, a very welcoming and friendly club, actively involved in our local community and wider charities. First and foremost, Rotary is about our clubs, though we are also part of the bigger family of Rotary with 1.2 million Rotarians around the world. Our club's plans for this year are focused on three areas; People, Projects and Partnership. The club is very sociable, with genuine friendships and wider interests between our members. This year, we are streamlining our business meetings, to allow more time for Rotary fellowship. We are also involving more of our members, to be more inclusive and share the volunteer workload across a strong team. My President's Charity is the Rotary Foundation, Rotary's own charity, which works across the six areas of service - promoting peace; fighting disease; providing clean water, sanitation and hygiene; saving mothers and children; supporting education; and growing local economies. As a club, we will continue with Youth, End Polio, International and local projects. 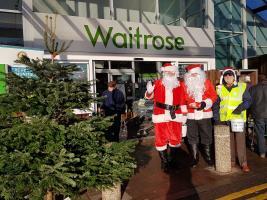 Santa and his elves will again be collecting for charities, and we will be supporting the collection of Chrismas Trees for St Lukes Hospice. We will continue our local community involvement. We have several members of our club trained by Cheshire East for the Community Emergency Support. We are also working with Sandbach Partnership, particularly in supporting the initiative to establish Dementia Friendly Sandbach. Visitors are always welcome - please see "future events" and contact us" on this website. To find out more about Rotary in general please click here. This will take you to the homepage of Rotary International in Great Britain and Ireland. · Encourage involvement in at least one multi-club community project or event and a corresponding international project. · MyelomaUK, on the recommendation of one of our new members Andrew Hinett. We have the best communication facilities we’ve ever had, with David Walls managing the website, new press officer Jo Webb and Jean Billingsley looking after the club’s new Facebook page. I hope this will raise Rotary’s profile in Sandbach and promote and foster the club’s activities in the local community, as well as encourage local community-minded people to join us. We should have a varied and interesting speaker programme as most have been/will be chosen by individual members. Let’s all have an enjoyable year! No Meeting due to Easter. All all invited to attend.